Cordray's has completed the required inspections and modifications and is one of a very select group of processors eligible to legally process all wild hogs. No more back-yard butchering jobs and messy clean-ups. We will custom process your hog kills to suit your needs. A Discovery Channel show on wild hogs said that in order to keep the population STABLE, you'll need to take out 7 of every 10! Cordray Farms on-farm store is now open! We have individual fresh, never frozen, cuts including T-bone steaks, ribeyes, sirloin roasts, bone- in sirloin steaks, flank steaks, fresh ground burger and smoked items as well. If you've never had farm raised dry aged beef that has never been frozen, you won't believe how good it is! Come by and check out our wildgame cookbooks and pick up a jar of local honey, too. We're open Monday - Saturday, 9 am to 10 pm, and on Sunday evenings from 6 pm to 10 pm. 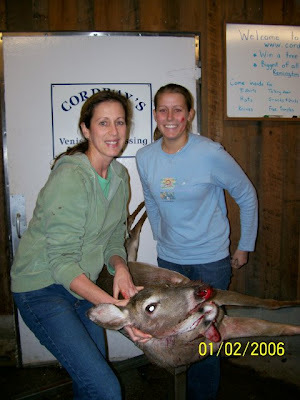 Cordrays blog, www.cordrays.blogspot.com, has all the photos on the deer and wild hogs coming in and more information on everything that's happening. Check it out! For now, we also have a few beef shares ready for immediate pick up. I can't promise we'll have them all season, but we do now! Billy and Hailey Guess got a big one! Raymond Riles gets the treatment! 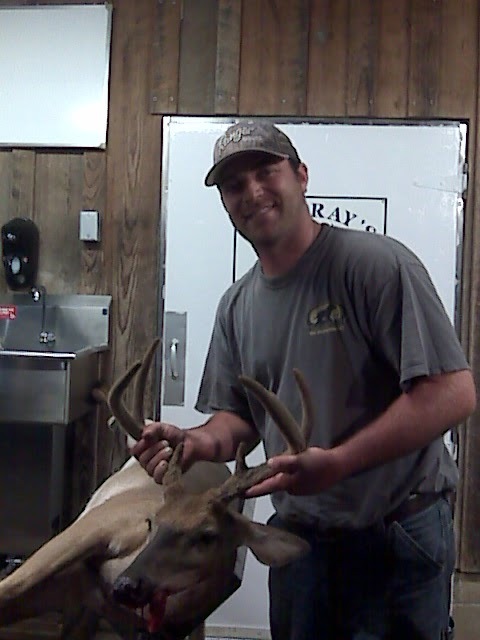 His 10 point was in full velvet. First deer on first day! We've got Cordray Farms beef smoked sausage. The smoked sausage comes two ways. Cheddarwurst is the smoked sausage with cheddar cheese cooked in. The Jalapeno and Cheddar Smoked Sausage is the just like the Peppers 'n Cheese you get with venison, only this is with Cordray Farms Beef. AND I even grew a few of the peppers! We always keep whole muscle Cordray Farms Beef Jerky on hand! We make two flavors of Cordray Farms Beef Jerky, pepper and teriyaki. We struggle to keep both flavors in stock! Right now, we've got Pepper Jerky. It's not hot as the name implies, but more of a pepper flavor. Teriyaki flavor coming soon! Opening at 9 am tomorrow morning! We've got Cordray Farms Beef Summer Sausage in the case. We have plain ones and some with cheese and jalapenos. It's the same recipe we use for the venison summer sausage, but this one's with good homegrown beef! Kristin's shown here with her mom, Kay Kierspe. When we get a new hunter, we induct them into the First Deer Hall of Fame. It involves lots of good-natured ribbing, some dunking in the gut barrel, and a free Cordray's hat or T-shirt. Be sure to bring your first one to us and we'll get a picture of your best side! Kenneth used to be the lead unloading guy, and always had to have his picture taken with the big bucks. Polaroids were sure expensive, though! Win a deerstand by having the biggest buck! Look what's been eating our eggs? After the first day or two I haven't gotten any eggs. Then I went out a little earlier this morning! When Michael was little they kept chickens and he remembers putting his hand in nests over his head to pull out a snake. Probably why he can't tolerate them today!! Alligator Season in 2008 brought out several "teams"
Already looking forward to Christmas hams? For the last two years, we've been offering smoked pork hams at Thanksgiving and Christmas. We start taking orders about Halloween and then custom cook them with the same recipe we use for the venison smoked hams. They are delicious! Be sure and order early, especially if you'll be ordering a quantity for employee gifts or for large family gatherings. Last year's allgators gave us a workout! Alligator season will begin in mid-September. They are very tough to handle in the skinning room. Imagine trying to turn over an animal 10 feet long weighing over 500 lbs.